Breakfast at hotel and then transfer to Halong bay. Day visits:Halong Bay, Lan Ha Bay, Three Peaches Beach - Ba Trai Dao. Activities onboard:Cooking demonstration, five elements signature dinner, Lan Ha bar, squid fishing. Day visits: Sung Sot (Surprise) Cave, Lan Ha Bay, Cat Ba Island, kayaking and swimming in Viet Hai Lagoon. Activities onboard: Tai Chi, Wheel house & engine room visit, barbeque buffet, Lan Ha bar, squid fishing, fruit carving. Check out and return to Hannoi. Day visits: Vung Vieng fishing village. Activities onboard:Tai Chi, Vietnamese traditional tea ceremony. Breakfast at hotel. Leisure day in Hanoi. - Availability: Prices are subject to change and the bookings are based on availability at the moment of booking. - Meals: Meals onboard include Vietnamese cuisines, seafood and western foods. Do advise your special food preferences, allergies or dietary requirements at least one week prior to the cruise date. - Massage reservation: Massages must be reserved in advance. Unused massage is not subject to refund. - Flight out: If you depart Hanoi right after the cruise on day 5, the flight time should be after 5 pm. - Valid passport: A valid passport is required upon check-in. Personal information is required for advanced registration. - Insurance: Insurance is not included in the package, it is recommended to purchase your own insurance prior to the departure from home country. - Special occasion: Cruise itinerary and schedule are subject to change - even cancel, due to weather, tide levels and operating conditions. 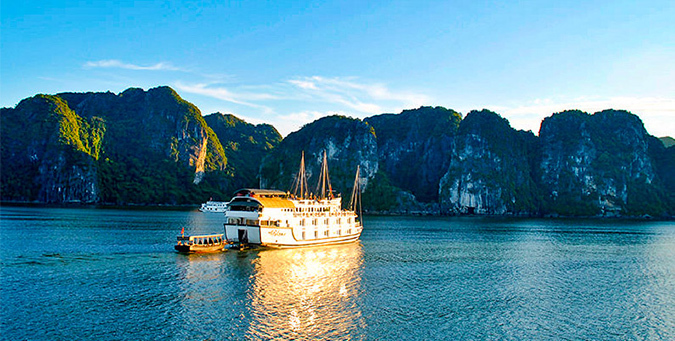 If there is no cruise in Halong Bay, accommodation & meals on board shall be replaced by accommodation at hotel in Hanoi. No sightseeing, excursion will be organized. Unused services are not subject to a refund. Book now No booking fees!